Leema Libra review | What Hi-Fi? What would the list of features on What Hi-fi?’s ideal high-end DAC look like? All current domestic digital connections is a given, and it would also be able to accept 24-bit/192kHz PCM files, as well as DSD (Direct Stream Digital) music streams. Right now, DSD ability might not be particularly important, but we would never want our hi-fi to limit our future choice of music. We’d add Bluetooth too, because it’s nice to be able to hear the sound of your phone or tablet through the main hi-fi. A variable output would be good, and why not add a headphone jack and good analogue section, so there’s no need for a separate preamp? Complexity, cost and cabling are all reduced, and that’s never a bad thing, even at top-end prices. Oh, and it has to sound really good too. Are we hard to please? Guilty as charged. But on paper, we could be describing Leema’s new Libra DAC. Take a close look at its specifications and many ways it goes above and beyond what we’d wish for. It’ll play PCM files up to 384kHz (if you can find any you actually want to listen to) and DSD 128 recordings too. Connectivity is excellent, as the Libra adds AES/EBU alongside a pair of I squared S digital inputs (using RJ45 connectors) to meet our demands. The latter is something that we’ve rarely come across in domestic products, but you can bet some hi-fi enthusiast, somewhere, will be rubbing their hands with glee at the news. There are also three line-level analogue inputs. Each of these can be configured for single-ended or balanced XLR use at the press of a button (accessible through a small hole on the back panel). 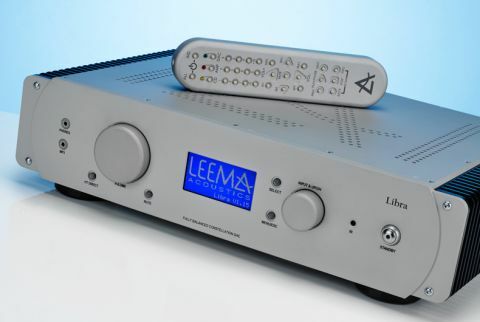 The Leema’s output is available in single-ended and XLR varieties too, with the option of leaving it fixed – to connect to a separate preamp – or variable where the Libra can drive the power amp or active speakers directly. The latter would make for a neat system. There’s also a set of connections for Leema’s in-house comms system that allows the Libra to communicate with the company’s other products. Overall, it’s fair to say this really is a well-equipped box. There’s something comfortably familiar about the Libra’s appearance. It reminds us of the company’s multiple award-winning Tucana amplifier, which is hardly a surprise given that it looks like the company has used the same chassis. The build is as solid as ever, and nicely finished with it. We doubt whether the DAC produces enough heat to justify the generous amount of heat-sinking included, but it looks good all the same. Take a peek inside and it’s functional rather than attractive, but there’s no denying the generosity of the power supply, particularly the unusually hefty mains transformer, or the competence of the build. The Libra is future-proofed to an extent too. It uses the company’s new, fully balanced Quattro Infinity dual-mono DAC modules. These are field-replaceable, so they can be changed as and when improved conversion technology becomes available. This is a nice touch, and a welcome safety net on such a premium-priced product. The Libra is a bit of a mixed bag to use. On a positive note, we like the feel of the two rotary controls. The large volume dial in particular is lovely, exhibiting the perfect amount of damping and precision while it turns. The intuitive way the on-board software responds to the volume’s movement feels natural too. The front panel buttons are fairly precise in use, though we don’t like their sharp-edged texture. Much more of an issue is the display. On the plus side it’s informative and, viewed from straight ahead, pretty clear. But off-axis it’s awful, with such poor contrast that at certain viewing angles we can’t read anything. We're not totally convinced by the remote handset either. It’s a nicely shaped metal unit built with a good amount of heft and a sensible button layout. But, those buttons don’t feel great in use and aren’t particularly nicely shaped. This DAC isn’t short of inputs – we counted 15 in total. There are three optical, three coax, one USB, three line level analogue as well as the two AES/EBU, Bluetooth and dual I Squared S connections. That’s great because we doubt there’s a two-channel system, no matter how complex, that the Libra can’t cope with. As we’d expect, the Libra’s USB connection is asynchronous, with the DAC taking control of the timing of information flow rather than the computer. Clocks used in audio products tending to be of higher quality than those used in computers, so the result should be better sound quality. If you run a PC you’ll need to load the dedicated driver software from Leema’s website. Mac owners should be good to go. Our review sample isn’t a new unit, but we give it a few days of use before listening seriously. The Libra was plumbed into our usual reference stereo set-up. The main source components are Naim’s NDS/555PS music streamer, a MacBook Air (loaded with Pure Music and Audirvana music software), a Cyrus CDi CD player and Clearaudio’s Innovation Wood turntable. The Libra doesn’t have a phono stage, so we use Cyrus’s Signature Phono with a PSX-R2 outboard power supply instead. Gamut’s D3i/D200i pre/power takes care of amplification duties driving our usual ATC SCM50s. Chord Company cables – digital and analogue – are used throughout. We start by testing the Leema’s Apt X Bluetooth capability with a Sony Z3 Compact and an Apple iPad 2. Bluetooth was originally an optional extra on the Libra, but Leema decided to absorb the extra cost of the module and now include it as standard. We’re glad it did, because this really is a fine sounding input. We listen to Fareweel Regality from The Unthanks and are pleased with the clarity and refinement on offer. There’s a good level of insight, fine handling of dynamics and pleasing way with the group’s vocals that unearths the nuances while still delivering the big picture with skill. If you think Bluetooth won’t sound good, listen to the Libra. It really does do a fine job. Put a physical link between the Leema and the source and things get even better. We play a range of music files through our Macbook from Hans Zimmer’s The Dark Knight Rises (24-bit/192kHz) and Stevie Wonder’s Innervisions (DSD), through to Eminem’s Encore (320kbps), and the Libra takes it all in stride. Those familiar with the company’s premium products will feel right at home listening to this DAC. It has the same full-bodied sound, which is immensely powerful but still capable of subtlety when required. The Libra delivers the Hans Zimmer set with considerable skill. Gotham’s Reckoning comes through with the right blend of tension and menace, with plenty in reserve for the large-scale dynamics when they hit. There’s so much power to the low-end in this recording and the Leema responds well, rendering rich, weighty bass that still has enough in the way of agility and precision to convince. Stereo imaging is impressive. It’s expansive, nicely layered yet stable even when things get busy, and that’s pretty often on this recording. Stevie Wonder shows off the Libra’s lovely midrange performance. It may be muscular, but there’s also an appealingly organic quality to the way this DAC reproduces the midrange. Wonder’s distinctive vocals come through with clarity and passion, with the Libra shining a bright light onto the nuances of his voice. Rhythmically, the Leema is surefooted rather than sprightly. It communicates the hard-charging momentum of Higher Ground with confidence but lacks the enthusiasm to really get our feet tapping. It’s this slight reticence to have fun, coupled to a tendency to round-off attack and sparkle at higher frequencies that give it the feel of a product that wants to sound comfortable, rather than one that goes all out to entertain. The upside to such an approach is that it’ll work well with a wide range of recordings and usually produce an acceptable sound. The downside is that your favourite music doesn’t tug at the heart (or feet) with the insistence that top-end hi-fi should. This sonic balance stays consistent regardless of input. Usually the line stages of a product such as this aren’t as good as the digital, but that’s not the case here. The Libra’s analogue inputs sound a touch cleaner and subtler than the digital alternatives, displaying a pleasing degree of clarity and naturalness. This really is a digital product that takes analogue performance seriously. That’s emphasised by the quality of the preamp section. We spent much of this test using the Libra straight into the Gamut D200i power amplifier. On the whole the combination worked well, and we didn’t feel the need to change back to the Gamut preamp straight away, even though it sounded better (as it should costing a few hundred pounds more than the Leema and being an analogue only device). The headphone output is less successful. With a pair of BeyerDynamic T1s (along with Grado’s PS500s) it lacks the transparency and fluidity of the line outputs. We’d get a dedicated outboard headphone amp if this were a priority. If you’re looking for a well-equipped digital hub that will also double as a capable analogue preamp you’re not exactly spoilt for choice. Despite our slight misgivings about the sound and some ergonomic aspects there’s much to admire in the Libra. It may not be our perfect DAC, but it’s not that far away either.